Armchair creative directors, bloggers, and professional ad critics alike had a point of view this week on which Super Bowl commercials were winners, and which were losers. What viewers did after the ads aired tells the real story, and Kia took home the trophy for generating the biggest pop in interest among low funnel shoppers. Shown below, when the Kia “Walken Closet” spot aired in Q3, there was an immediate surge in low funnel car Shopping traffic looking for the brand across automotive websites. What this chart shows is the percentage increase and decrease in Shopper activity over the average activity throughout the game. Activity is defined as content and listings searches on dozens of auto sites, for KIA throughout the game. 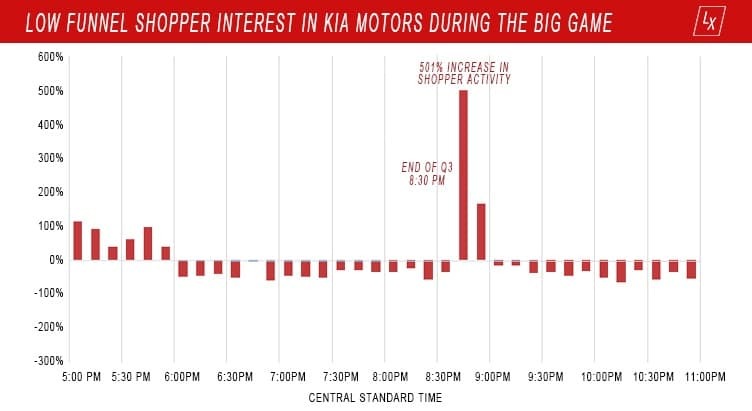 The 501% increase in Shoppers seeking out KIA was the biggest surge in interest displayed among all auto brands in the Big Game. Whether “Walken Closet” won your vote or not, low funnel shoppers were clearly intrigued by the ad and voted it most impactful with their clicks.